Gentle Giant came from the remains of the brothers Shulman pop group, Simon Dupree and the Big Sound. That band had some minor chart success; the single "Kites" broke into the UK Top 10 in August 1967. More surprisingly were the idolizing legions of teenage girls that the band attracted, documented in the British television show "Man Alive." But at the turn of the decade, the three Shulman brothers were ready to make the switchover to a more serious and Progressive sound and show the world their considerable musical talents. They teamed up with Royal College graduate Kerry Minnear on keyboards and drafted Gary Green on guitar while Martin Smith would be the band’s first drummer. Their first album was released on the infamous Vertigo label. 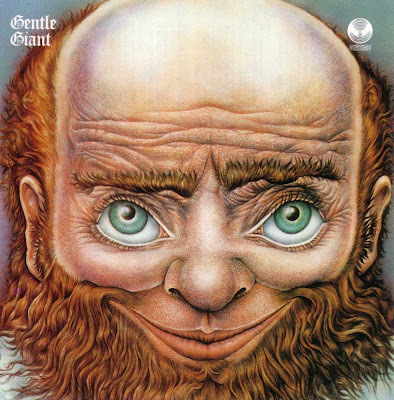 An auspicious debut, Gentle Giant would become one of the most celebrated and cerebral of the Prog era. Their complex arrangements, shifting time signatures, and expansive artillery of instruments would become their trademarks. Some of that was in their debut, particularly in "Giant" with its excellent keyboard break and in the Moog bass line from "Alucard" (Dracula backwards). Giant were a clever lot! But composition would also remain their strong suit. Take "Nothing at All" - gentle folk number? Not really. It breaks down into a cacophony of phased drums and piano. In fact, the Giant are more bawdy than brainy here. The bluesy digressions of "Why Not" offered some of the same, but also revealed another Giant tradition - the ability to rock out, something the band never forgot. Charting however would always be a problem, especially in their native England.